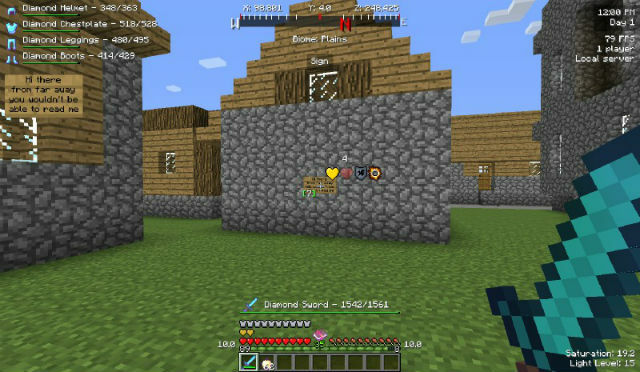 Better HUD Mod 1.12.2 is an issential mod that allows you to add up to 28 new elements to Minecraft HUD while you are in game. Once you installed this mod, you will be given much customizability and each element you have, you can enable or disable or even move it into new position if you want. Blood splatters: When you’re hit, blood splatters will show up on your screen. They fade away over time. Modes: Sparse, Normal, Dense, Denser. Compass: Shown at the top of your screen, the compass shows you which direction you’re facing. Coordinates: Shows your coordinates at the top of the screen (above the compass). Modes: Spaced or Together. Spaced coordinates have a space between each coordinate, together are all linked. Enchantment Indicator: Shows you when you can enchant (above your XP bar). Displays as an enchanted book. Equipped Info: Shows what armour and tool you’re holding, and displays the damage of each item. Modes: Tool, Armor or Both. Food and Health Stats: Shows how much health and food the player currently has as a numeric value. Optionally displays saturation value in the bottom right corner. Modes: Saturation or No Saturation. Heal Indicator: Shows when the player will heal naturally by displaying a green plus by the health bar. Light Level: Shows the light level of the block the player is standing on. Potion Display: Displays current potion effects with amplifiers. Will start to fade out the potion effect icons when they are running out. Modes: Left, Center, Right. If center is chosen, the effects are displayed by the crosshair. Exp. Info: Shows how much experience the player has in a level and how much is needed to reach the next level on either side of the experience bar. Clock: A clock. Shows both the time and the current day. Also includes a small bed icon to indicate that the player can sleep. Modes: 12hr Left, 24hr Left, 12hr Right, 24hr Right. Displays either 12 hour or 24 hour time, and can be displayed on either the left or right top corners. Hunger Indicator: Displays a flashing steak icon when the player does not have full hunger. Modes: Above Bar, Center. If center is chosen, the icon is displayed by the crosshair. FPS: A simple FPS counter. Connection: Shows information about the current server (players online and server IP). Sign Reader: Displays the text of a sign when looking at it from far away. This enables the player to read signs up to 200 blocks away, even if they’re blocked by entities. Modes: Text left, Visual Left, Text Right, Visual Right. Text mode adds text to the left or the right containing the text on the sign, and visual mode shows an actual sign on the GUI with text. Block Viewer: Displays the currently looked-at block in a box. Note that this element does not always translate block names properly, sadly. Modes: Top Left, Top Middle, Top Right, Bottom Left, Bottom Right, Center (by the crosshair). Arrow Count: Displays a counter of arrows the player has in their inventory to shoot while holding a bow. Modes: Left or Right of the hotbar. Mob Info: Displays info about mobs (name and health, numerical and displayed). This shows only when looking at a mob, like a name tag. Horse Info: Displays optionally jump height and speed of a horse, displays similarly to mob info. Modes: Jump, Speed or Both. Distance: Shows how far the block you’re looking at is (up to 200 blocks away). Modes: Type 1 (number alone), Type 2 (with “m away”). Hide Players: Hide all other players currently in the game (or include yourself). Modes: Only others, Include me. Biome: Shows what biome you’re currently in. Modes: Left, Middle (below compass), Right. Breed Indicator: Displays how long it will be until an animal can breed, and what item must be used. Full Inventory Indicator: Displays text on either side of the screen when your inventory has no empty slots remaining. Water Drops: Displays water droplets that trickle down the screen whenever it’s raining, or you’ve just jumped out of water. Item Pickup: Shows text and item icons of items you’ve just picked up on the screen. It counts how many items you’ve picked up, but if you don’t pick up any for a while, it’ll fade away and reset the counter. The default key to open the HUD configuration menu is U. This can be changed in the controls settings, under “Miscellaneous”. Each can be turned on or off and modified. Download the Better HUD Mod from link below.